Ok, so I could write and illustrate a lot about history, but my priority lies somewhere else. It doesn’t matter, because others have written about it. 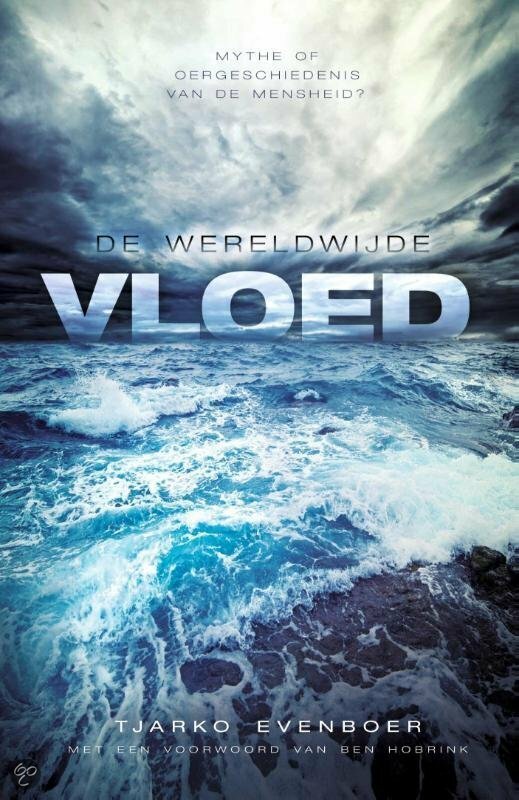 I can recommend the book “De wereldwijde vloed” of Tjarko Evenboer. It’s only available in Dutch so far. Hopefully this book will be available in English later. Read it and be amazed. There is so much more information available about history than you could imagine. The flood – myth or mankinds universal history? What would we expect when Genesis 1-11 is real history? Suppose that there really was a global flood, and that the events mentioned in Genesis 1-11 are not mere stories, but real history. And suppose that our ancestors really were the only survivors of the flood. What would that imply? First, we would expect to find references to that great catastrophe in legends, myths and ancient writings all over the world. It would be very implausible if the Bible was the only historical source telling about such a disastrous catastrophe. Second, we would also expect to find memories of the pre-flood world in worldwide traditions. We should, for instance, find echoes of the creation of Adam and Eve, the Garden of Eden, the two trees of paradise and the Fall among traditions of all nations – or at least stories with significant similarities. Third, we would expect to find references to Biblical events that took place shortly after the flood, like the tower of Babel and the confusion of tongues. But as the Bible states that the nations parted after that confusion, it would be only logical that our ‘universal history’ would stop at that point. In brief: the above is exactly what we observe when we start looking into the oral and written myths of hundreds of nations. Chapter 1 starts with an survey of flood myths. Starting with the Indian (Hindu) flood myth of Manu and his sons Sherma, Charma and Jyapeti, a journey is made through the five continents, involving nations as ancient Egypt and Greece, Scandinavia, China, the Maya and Inca indians, the Aborigenes of Australia and tribes of Africa. These flood myths are thoroughly analysed and compared. Two modernistic hypotheses according flood myths are examined: a) the idea that they can be traced back to local floods, and b) the theory that they sprung from christian missionairy activity. The author concludes that none of these modernistic hypotheses give a satisfactory explanation for the striking similarity of the accounts. Chapter 2 handles myths that seem to contain memories of the pre-flood world. It examines pagan creation accounts that speak of a divine garden were the first man and woman were created. We discover that the two trees of paradise are present in a great amount of legends, and that the tree of life (often in connection with the snake) has been worshipped in many cultures, providing a breeding ground for the common pagan custom of tree worship. This chapter also handles pagan legends that tell about the Fall of the first man and woman, where in many cultures the fruit of the tree has, quite amusingly, been replaced by other food. Chapter 1 and 2 together provide a powerful argumentation that Genesis 1-11 is real history, of which we see reflections in myth and folklore of all continents. The author states that Noah and his family really were the ancestors of humankind, and in the centuries after the flood the nations took their common history with them, leading to a global ‘collective memory’ that strikingly affirms Genesis. a) the Biblical story contains the original eyewitness reports. Analysis of the structure of Genesis makes it plausible that Genesis 1-11 is in fact a series of clay tablets which were recorded by the antediluvian patriarchs, and were passed on from father to son to Noah, and through Shem to the nation of Israël. Moses was the ‘redactor’ of Genesis 1-11, who put these accounts together. Proofs of this thesis are also found in ancient Jewish and pagan literature. b) the Biblical story is scientifically reliable, in sharp contrast to the pagan accounts. Chapter 4 is about the Tower of Babel – or rather, about myths that speak about the building of a large tower, and the subsequent confusion of languages. These myths are found in Babylonia (where king Nebuchadnezzar II mentioned both tower and confusion), but also in Greece, China, Southeast Asia, India, Papua New Guinea, Polynesia, Africa and North en Central America. Chapter 5 tells about the dispersion of nations, and more specifically about Noah and his sons Shem, Cham and Japhet as mankinds progenitors. Study of ancient genealogies reveals that Noah and his sons are recorded as patriarchs and kings, and later often became worshipped as gods in pagan cultures. Noah, for example, is called Nüwa by the Chinese, Manu by the Indians, Nuah by Southeast-asians and Noa by the Scandinavians, but we also see him back in gods such as Nu (water god of ancient Egypt) and Anu (father-god of the Babylonians). His son Japhet appears in genealogies of Indo-European nations as a great patriarch, but after several centuries became worshipped as father-god Japati in India, as Japetos in Greece and as Jupiter in the Roman Empire. We observe the same pattern in regard to the other sons and grandsons of Noah. This chapter also reconstructs migration routes of the tribes of Noahs sons and grandsons, based on the Bible, on historical and mythical accounts and etymological research. Chapter 6 is entirely about the American Indians – firstly because their traditions greatly support the Biblical accounts, but secondly because their origin is shrouded in mystery. The common evolutionary hypothesis connects the Indians solely to Asia and claims they have been living on the American continent for at least 10,000 years. The author connects American Indians not only with Asia, but also with ancient Europe, Africa and the Middle-East, based on historical evidence as well as genetic data. These migrations are, contrary to the evolutionairy thesis, totally in line with the Biblical time scale. The author also posits the hypothesis that the Phoenicians already discovered America in the time of Solomon, which challenges the evolutionary idea that the nations of antiquity were ‘primitive’. Chapter 7 reconstructs a major event that happened shortly after the flood: the ‘religious revolution’ started by Hams son Cush and grandson Nimrod. We observe the effect of the Tower of Babel, and the subsequent rise of pagan rites and idoltry, spreading from Babylonia to the ends of the ancient world. Chapter 8 challenges the evolutionary idea that the belief in one God evolved from polytheïsm. The author looks into the oldest and earliest religious accounts of all great nations (Babylonia, Greece, Egypt, China, etc), which reveals an original monotheïsm. Furthermore, this chapter reconstructs how monotheism gradually fell into polytheism, and ultimately into the belief in impersonal forces. The books conclusion is that Genesis is fully reliable, and that myths and legends of all nations point to one common history, which is, in fact, the ‘universal history’ of mankind. The ‘common ground’ of all mythological concepts, is virtually the story that Genesis 1-11 tells. The book has a foreword by Ben Hobrink (author of ‘Modern Science in the Bible’). The book contains 8 chapters and 9 appendixes, and counts +/- 450 pages. The main arguments are supported with hundreds of endnotes and references. The book is largely illustrated and uses tables and maps where needed. Tjarko Evenboer (1983) is a researcher in the field of Bible, history and mythology. He graduated as a bachelor of Communications and has written articles for magazines as Weet (Dutch creation science magazine) and Journal of Creation. His book has been reviewed by experts from different specialties. 3. GENESIS – ALSO A MYTH? 6.1 The Indians – who were their ancestors? Hope this does get translated to English. I might have to learn Dutch soon….